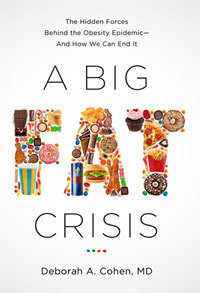 Cohen lays out the daunting internal and external forces that have led to a frightening rise in obesity in America. She offers innovative and provocative paths out of the problem, including one of my core beliefs – cities should be designed around people, rather than cars. Among other things, elected officials should champion infrastructure investment that encourages more active and healthier lifestyles. What can be done about ‘the public health crisis of our time’? The national conversation about obesity, childhood or otherwise, has been a bus mired in the mud and spinning its wheels to get out. No matter that the first lady of the United States has been driving the bus or that the critical mass of diet/obesity books ensures that nearly every obese American could have their own individual text. RAND senior natural scientist Cohen (co-author: Prescription for a Healthy Nation: A New Approach to Improving Our Lives by Fixing Our Everyday World, 2005, etc.) acknowledges as much—she consigns healthier eating guidelines to the appendix—but her work, with one foot in science and the other in culture, instead examines the driving forces behind the obesity epidemic. Specifically, she poses the challenge as twofold: human nature and the unconscious and/or irrational decision-making process around what and how much to eat, and “the modern food environment”: inexpensive, high-calorie, convenient, low-nutrition foods, crafted in labs to push all the right “tastes good, give me more” buttons. Cohen takes a behaviorist approach to identifying the antecedents for eating choices, suggesting that the focus on self-control as a key element actually undercuts efforts to make change, given people’s assumptions about human nature and our genetic makeup. Studies indicate that biological imperatives, coupled with increasingly complex methods of marketing, hobble even the best intentioned plans. The author makes a compelling case. If an “epidemic” of obese people are finding it too difficult to achieve their health goals, it’s a societal imperative to address the environmental factors that undermine these attempts. Think of it as preventative care rather than knee-jerk reactionary responses. Cohen, an epidemiologist and medical doctor at the RAND Corporation, makes a convincing case that obesity involves far more than a failure of willpower. Were people really more disciplined 30 years ago, when only one in six U.S. adults was obese, instead of the one in three today? Unlikely, she says. “Physiologically, our capacity for self-control has not shrunk over the past several decades.” She blames both the way humans are wired to overeat when presented with the opportunity and the transformed food environment, which makes large portions of cheap, high-calorie foods too easily available. Little nibbles add up: The average individual weight gain of 22 pounds over the past 30 years in the U.S. can be explained by our eating just seven extra calories per day. Cohen proposes standardizing portion sizes and running counter-advertising against unhealthy food products. Her other ideas include following the model of state limits on the number of places that can sell alcohol: why not do the same with doughnut shops and ice cream parlors? And why not restrict all-you-can-eat buffets, and use warning labels, like those for cigarettes and alcohol? Though some ideas seem far-fetched, Cohen certainly presents a fresh, thought provoking take on how to fight the obesity epidemic. Not Enough Fruit and Vegetables or Too Many Cookies, Candies, Salty Snacks, and Soft Drinks? Deborah A. Cohen, MD is a senior natural scientist at the RAND Corporation. She received her BA at Yale University, MPH in epidemiology from the UCLA School of Public Health, and her MD from the School of Medicine, University of Pennsylvania. She has served on several advisory panels for the National Institutes of Health (NIH) and was a Fulbright Senior Scholar in Brazil. She lives in Santa Monica, California.